I didn’t have anything planned to research on Trove, so I decided to see if I could find out more about someone with an event that occurred on today’s date, 3 May. Thomas Henry Featherstone died 3 May 1952 at Royal Newcastle Hospital, so I decided to search for any additional information about Thomas. The first article I found for him was about his divorce from Annie Maud Stow. Misconduct, which was alleged to have taken place at Wallsend with Lily Smith, was the ground upon which Annie Maud Featherstone, formerly Stow, sought a divorce from Thomas Henry Featherstone, a native of Greta. The suit was undefended. Petitioner, for whom Mr. J. D. Reid appeared. said she lived at Newcastle West. The marriage was celebrated by Rev. T. Parr, at Wickham Methodist Church, on March 29, 1898. The issue of the marriage was nine children. The respondent was a heavy drinker, and she had to leave him two years ago last July. Since then she had seen him, but not speak to. When she left him they were living at Wallsend. His conduct to her had also been cruel over a period of several years. On the occasion that she left him he gave her a beating, and several times had threatened her life. She had only seen the co-respondent once. That was a week ago, when she attended Betts’Theatre with the respondent. Elsie Melville Pagett, a married woman of Maitland. said the parties were her parents. Some time ago she was living with her father in Close street, Wallsend. The co-respondent, Lil Smith, was living at the house, too, and had been there three months before witness came. The respondent and co respondent shared the same rooms and made no secret of it. Three weeks ago, when witness visited the house, the same state of affairs obtained. The co respondent was known as Mrs. Featherstone to the tradesmen. Her father and Lily Smith had also lived together at Happy Valley. Beatrice Florence Featherstone, a single daughter of the petitioner, said that at Happy Valley the respondent and Lily Smith lived together as man and wife. She told her father he should be ashamed of himself. He said, “That is none of your buisness. That is my business.” The issues were answered in the affirmative. The next article I found was when Thomas became bankrupt. 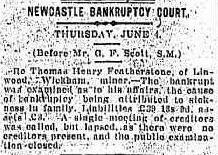 Re Thomas Henry Featherstone, of Linwood, Wickham, miner. – The bankrupt was examined as to his affairs, the cause of bankruptcy being attributed to sickness in family. Liabilities £39 15s 3d adarial.CA(?)) A single meeting of creditors was called, but lapsed, as there were no creditors present, and the public examination closed. 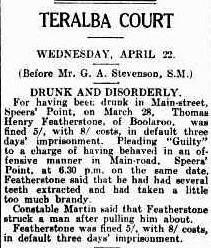 For having been drunk in Main-street, Speers’ Point, on March 28, Thomas Henry Featherstone, of Boolaroo, was fined 5/, with 8/ costs, in default three days’ imprisonment. Pleading “Guilty” to a charge of having behave in an offensive manner in Main-road, Speers’ Point, at 6.30 p.m. on the same date. Featherstone said that he had had several teeth extracted and had taken a little too much brandy. Constable Martin said that Featherstone struck a man after pulling him about. Featherstone was fined 5/, with 8/ costs, in default three days’ imprisonment. Mr. T. H. Featherstone, who died at Royal Newcastle Hospital, aged 77, moved from Abermain to Marks Point eight years ago. He leaves a widow and eight children. The funeral was to the Beresfield Crematorium. Rev. Pidgeon conducted the service. After their divorce, Annie married Leonard Clyde Bryant in 1928. Annie died in 1948. Thomas never remarried.